This device incorporates an rigid articulated arm, pivoted in two locations. It can be guided both sideways and vertically across the whole working area very precisely once clamped. It always remains vertically aligned. 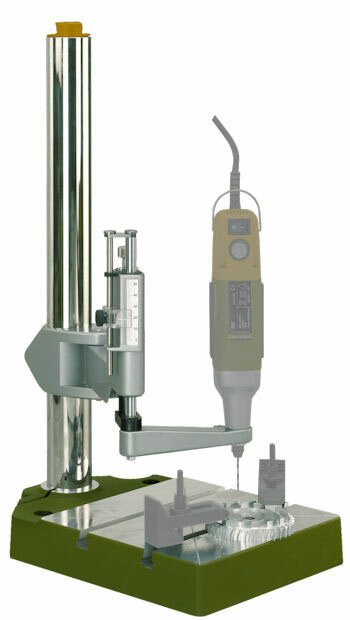 This means that any drill holes made are always precisely square to the workpiece surface. A depth stop and depth gague are included, and an adjustable spring automatically pulls the device back to the top rest position after drilling. Suitable for all 20mm spindle collar drills, such as precision drill/grinder FBS 240/E, professional drill/grinder IB/E, longneck straight drill/grinder LB/E and Micromot 50, 50/E and 50/EF. Power-tool, clamps and workpiece pictured are not included. Click the button below to add the Proxxon Precision drilling device with base plate and drill column BV 2000 to your wish list.